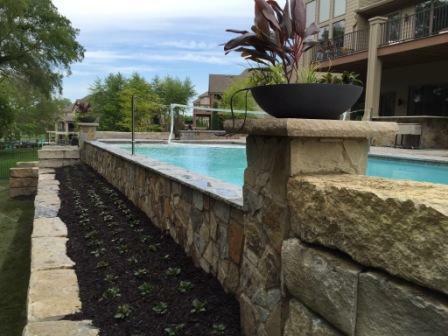 The finer finishes of a custom in ground pool by Elite Landscaping will enhance your outdoor living environment for years to come. 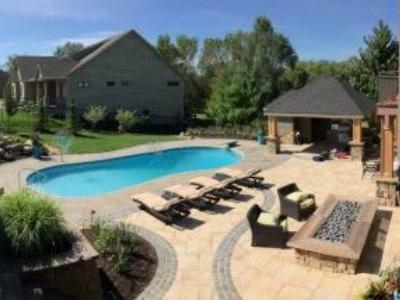 The best backyard swimming pools are Elite Landscaping pools, as seen in premier neighborhoods throughout Omaha and Lincoln, Nebraska. 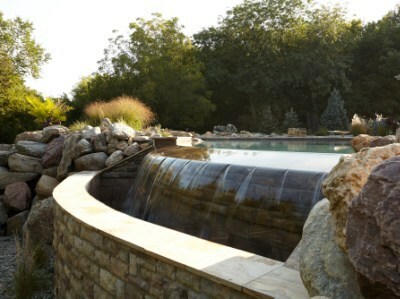 Elite Landscaping’s concrete swimming pools feature the highest quality structural integrity. We specialize in custom in ground pool features, including: infinity edges, bubbler jets, zero-entry areas and swim-out corners. We can even incorporate the latest technological controls for backyard pool lights, cleaning ease, and energy efficiency. 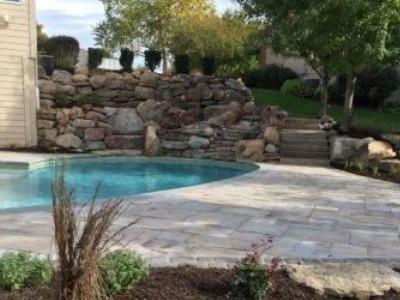 Concrete swimming pools from Elite Landscaping turn dreams into realities. 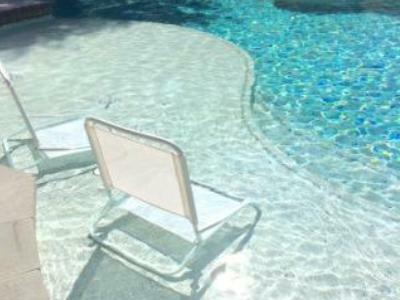 Our expertise and design allow for custom swimming pool elements such as hand smoothed steps, swim up bars, sun shelves, poolside waterfalls, and more. 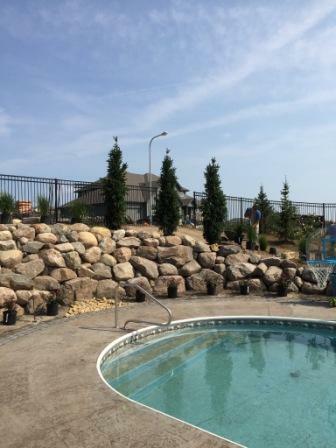 Our pool specialists seamlessly integrate your concrete pool deck or paver patio with other landscape features to meet your outdoor living needs. 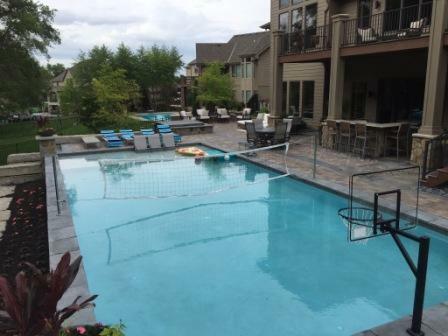 We can incorporate swimming pool and spa retaining walls, natural rock waterfalls, boulders, seating areas, and playful pool toys, such as basketball hoops, water jets, slides, and more. Q: What are the differences between a concrete swimming pool and a vinyl liner pool? A: There are some primary differences between concrete outdoor pools and vinyl liner home pools. 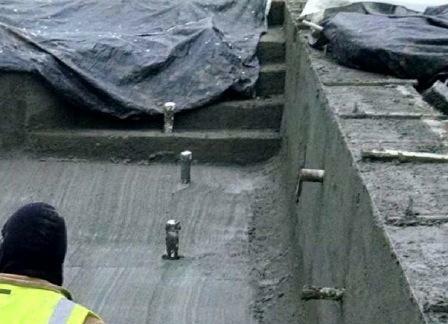 Concrete is structurally stronger than the metal structure of a vinyl liner swimming pool. 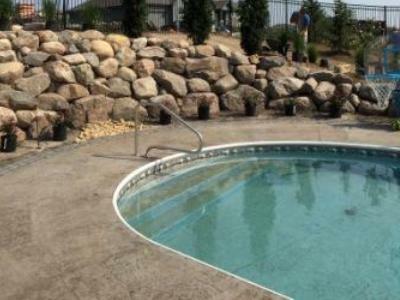 Since concrete can be poured and shaped into almost any configuration, more customization and functions can be added at the outset, whereas the prefabricated housing of a vinyl liner pool limits the options available. A: Consider that the concrete structure supporting your pool is thicker than the slab sitting under your house. 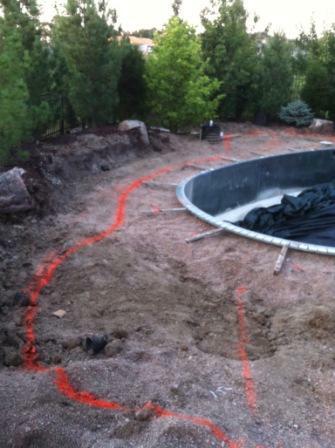 Elite Landscaping’s installation process is certified by engineers. 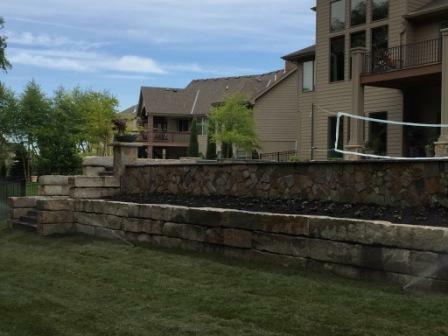 We create a double mat rebar frame or exoskeleton of 1’ x 1’ horizontal and vertical sections, each with a ½” piece of rebar, then fill it with premium shotcrete to form 8”+ thick walls and a 15” thickened bond beam that locks the pool structure. Our crew then hand carves, smoothes, and monitors the concrete during the entire curing process so it does not dry unevenly or crack. Additionally, we build the pool frame atop a 6” layer of clean rock, which prevents cracking, shifting, and moisture and water getting trapped underneath. 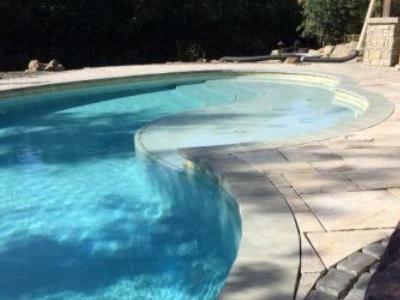 Q: Does a concrete pool cost significantly more than a vinyl liner pool? A: Not always, this is a misconception. Let’s compare the average cost of an inground pool installation: If a vinyl liner pool and a concrete pool were made to the exact same standards, by the time you add in liner pool upgrades that come standard with a concrete pool design, the difference is only a few thousand dollars. The truth is, concrete pools give you everything you want the first time. A concrete pool lasts 10 -20 years longer before major maintenance is required, and needs fewer replacement parts over its lifetime than a vinyl liner pool. As with any major home improvement project, a good guide to your return on investment is how long you plan to enjoy the pool. If you plan to stay at your home more than five years, chances are you want to invest in something that’s designed right and built to last. 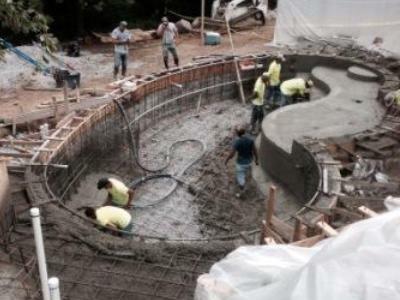 Q: How long does it take to install a concrete pool? A vinyl liner pool? 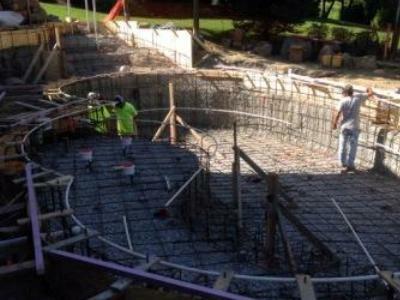 A: A concrete pool takes as little as 45 days to complete, from start to finish. 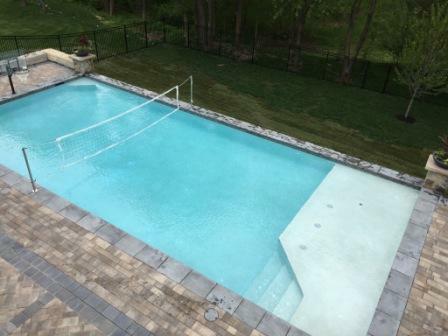 Some large, custom pools can take up to 70 to 90 days from start to finish. During the first part of your pool project, the Elite Landscaping crew digs, ties the rebar, shoots concrete and installs plumbing. As the shell cures, the crew closely monitors the drying process while installing finishing touches. A vinyl liner pool takes 10 days to two weeks from start to finish. This may vary by job site, for instance, if additional support structures are needed on a hillside or unstable soil. Depth Slope Gentle slope(s) at custom intervals. Abrupt decline with ramp(s) connecting at preset depths. Interior Lining A plaster shell coats the concrete. Plaster lasts 18 to 20 years. With a well-balanced PH and a well-maintained pool, the lifespan of the plaster coating can extend up to 25 years. A vinyl liner can range from 24 to 28mm thick and lasts for 8-10 years. If the liner tears, puckers, or rips at the seam, the entire liner needs to be replaced at a cost of $3,500 to $4,500 each time. Coping (Pool/Deck Edges) Concrete can be hand smoothed for a level, fitted edge; custom pavers or concrete can be used. During a heavy rain, water overflow does not harm pool edges; it simply flows over the smooth concrete. The deck level and materials used must work around the structure of the vinyl liner pool leaving fewer options and a pronounced “lip.” Flooding rain can get behind the lip into the liner track, and cause it to “bubble out’”and pull away from the wall. Skimmers/ Lids/Autofill Lids can be customized to match the color and paver material of the deck. Skimmers are completely enclosed; placed directly into concrete shell for long term stability. Lid selections are often plastic, can crack easily, and come in limited colors. 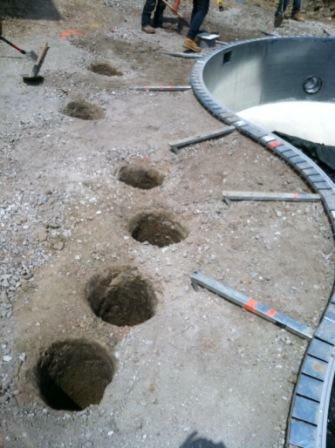 Skimmers are trenched; can loosen from the metal or plastic pool structure over time and cause tears in a vinyl liner. Steps Entry steps can be custom made to any shape, size or depth. The options are endless. Concrete steps also allow for a more gradual entry, which is safer for everyone, including children, the disabled, and older adults. Concrete steps can be tiled for an additional aesthetic and safety demarcation. Fiberglass steps come in a variety of sizes. Stretching a vinyl liner over steps can cause puckering in the corners. The liner can tear easily with wear over time, especially from sharp objects such as a dog’s claws or chairs being dragged into the pool. Ladders No ladders are necessary. Concrete pool entry/exit options include: zero-entry or “beach like” walk ins, corner swim-outs, hand molded steps, sun shelves, and more. Ladders can get hot, slippery and need to be replaced if dented or damaged. They have to be removed when the pool is covered. Flip out ladders are available, but can cause damage to vinyl liners over time. 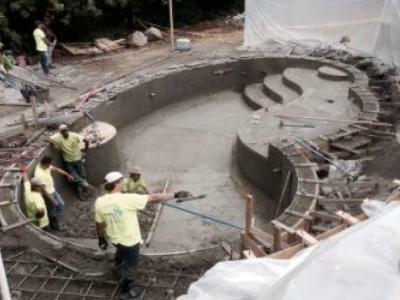 Swimming Pool Size and Shape Concrete pools are custom molded and can be smoothed to any shape. They accommodate custom features such as zero entries, swim up bars or benches, gradually sloping depths, sun shelves and more. While many options are available, vinyl liner pool shapes are limited by the metal or plastic structure that supports them. Structural Strength Concrete pools are reinforced with a double mat rebar “exoskeleton” and meet the custom specifications of your jobsite. Structural strength requirements are determined by an engineer considering factors such as unstable soil or a hillside. Vinyl liner pools have a metal or plastic structure. If placed on unstable ground, deep pilings may have to be drilled in the ground to support the structure. 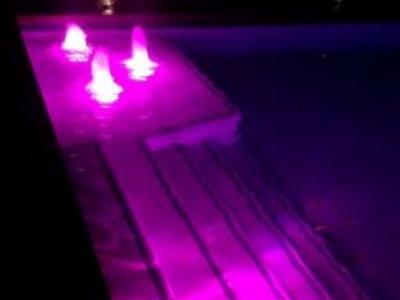 Swimming Pool Lights and Electronics Custom LED lighting and landscape lighting can be placed anywhere. 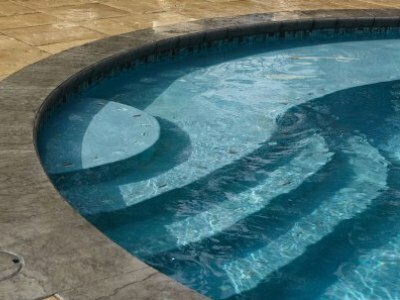 All lighting and other pool features such as the heater, jets, or custom bubblers and waterfalls can be connected to a master Intelletouch panel. This phone or tablet app interface allows all pool functions to be turned on or off with one touch technology. Limited, prefabricated lighting options are available. 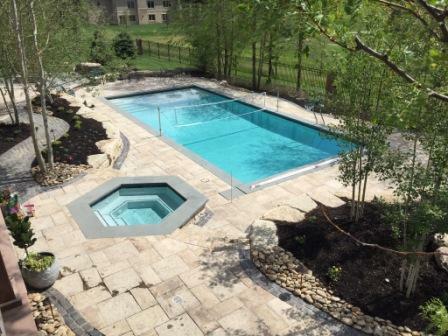 Compared to a concrete pool where every feature is installed at once, vinyl liner pool functions can be more difficult and costly to tie in with other pool features, such as deck and landscape lighting, the heater, etc. Zero-Entry and Sun Shelf Areas Zero entry areas start at a no water depth and graduate to 12”, which feels like a beach because you can walk right in. It is a safer pool entrance for young children and anyone who has difficulty on steps. A sun shelf is a shallow area about 10-12” deep, where lounge chairs and even umbrellas can be placed in the water. Kids can use the zero entry or sun shelf area as a splash pool, or push off into the deeper water and swim back easily. Not available. Bubblers, Self-Cleaning Jets, and Other Features In-ground bubblers and “self-cleaning” jets can be installed directly in the floor of a concrete pool. LED bubblers are a great way to keep the kids entertained and safely occupied in shallow areas, plus they add visual interest and uplighting. Pop-up oscillating jets push debris to a center catcher, keeping the pool clean, minimizing your workload, and eliminating the need for a robot vacuum. Self-cleaning jets also improve energy and heat efficiency by evenly distributing hot water from the pool floor up. Not available.